The company, which showcased new products for 2019 as well as an array of its other best-selling products, recorded increased footfall to its stand over the three-day exhibition period. In addition, one of Zest’s new products, the Maisy Set, was a finalist in the Glee New Product Showcase Awards 2018. Comprising two low folding chairs and a small, square folding table, the set is both stylish and portable. Not just for patios or the garden, the Maisy Set could easily be used in the park or at the beach. “We thought 2017 was good but Glee 2018 surpassed itself in terms of the number of people we spoke to, enquiries made and feedback received from visitors to the stand. “While the main focus was our innovative range of products for 2019, we were also able to showcase award-winning and best-selling items from our other ranges. These went down really well and acted as a reminder to buyers of the breadth of our offering. Zest 4 Leisure has had a busy 2018 with the company focused on designing new concept garden furniture. Of the new products, the Noah’s Arbour, so-called because its design is reminiscent of Noah’s Ark, and the Christina Set, which is ideal for people who regularly entertain alfresco, proved particularly popular. 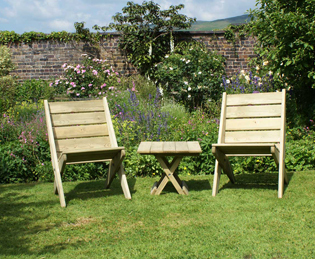 Manufactured from pressure treated timber, all of Zest 4 Leisure’s garden furniture is low maintenance and will stand the test of time with a 10-year guarantee against rot. The timber used is certified by the Forest Stewardship Council and has been harvested from responsibly managed forests.